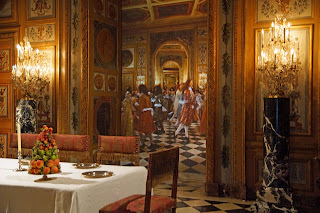 Versailles, the palace of Louis XIV, the Sun King, was a marvel of gilt, opulence, formal gardens, the Hall of Mirrors, and the the royal bedchamber where Louis received his courtiers, advisers, and personal staff. Le Lever du Roi and the evening Coucher, institutionalized during his reign, were important moments of the day. The second service would be even more impressive: Scallops with oyster liquor; wild duck cromesquis à la Villeroy; hare stew; roast beef, carrots, and smoked eel; and wild salmon au sel. Followed by green and fresh herb salad in gold leaf, morel soufflé, and an assortment of fruit and an edible candle. French gardens are formal, carefully planned and organized according to logical theorems and The Golden Mean. One did not simply stroll through the rose gardens but admired their symmetry, simple elegance, and color palette. It is no wonder, therefore, that Americans, with a culture based on principle (liberty, justice, equality) but with no long, storied ancestry, long for the gilded elegance of Europe. If one has been successful in life, done all the right things, worked hard, and accumulated wealth, why not live out one’s dreams and fantasies. Why stick to American history and the rigorously Protestant residences of Cotton Mather and the Puritans when French grandeur is possible? The McMansion was born out of prosperity, imagination, and a respectable and very American bourgeois sensibility. Homes like this have been built by investment bankers, real estate moguls, sports legends, movie stars, and newly-Americanized Arabs; and are found in the suburbs of every large American city. None are exact replicas of the real thing. That would deny individual and personalized innovation and creative enterprise. The objective is to design a residence to suggest Versailles, the Gritti Palace, or the Schonberg Palace of Vienna – not to create a carbon copy. A lot of people sniff at McMansions and complain that they are crass, ugly, and tasteless displays of new money; but all these gripes are just sour grapes. Most people would give their eye teeth for an indoor swimming pool, theatre-size media center, vaulted ceilings, mirrored bedrooms, Jacuzzis, fitness centers, miniature golf courses, bowling alleys, formal dining rooms, and a conservatory. Americans are a snobbish people and always find someone to sniff at whether above or below them on the cultural scale. If it isn’t the tasteless Arabs in Potomac whose living rooms look like a pasha’s harem, it’s the black people who drive big Chrysler 300s on credit. If it isn’t trailer trash then it is the pushy New York Jews who wear mink in the summer and jewelry in the afternoon. Or the nouveau Italians who decorate their parlors with faux sconces and Venetian landscapes. Or New England WASPs of the well-worn and patched Harris Tweed, old station wagons, and démodé Topsiders. Martha’s Vineyard has always been a WASP redoubts – an understated place of old money, conservative English taste, good manners, and impeccable breeding. In the past decade the descendants of the old founding families began to sell the old homesteads to provide financial security for their old age and for their children who had long ago moved to the mainland. The best prices were paid by ‘outsiders’ – New York, Boston, Washington, or Los Angeles – buyers who were unschooled in the old traditions of the island, uninterested in and dismissive of them. They wanted to scrap the wood frame, weathered houses and build something big with lots of land. Something gated with a golf course and private beach access. The island’s younger middle aged residents, some relatives of the old families and others who had put summer roots down years ago, were up in arms. This mainland onslaught had to be stopped; for if it wasn’t, the island would lose its particular New England charm and reserve. Marshes would be drained, meadows dug up and paved over. While these residents had a point, they were simply sniffing at the New York interlopers and real estate predators whose vision of the island was most certainly not theirs. Someone has to stand up against bad taste, the residents said, and the barricades must not be crossed. Of course there was nothing they could do, since money talks, and everyone from politicians to homeowners saw profit in outsider development. Slowly but surely the island morphed into every other wealthy gated enclave in America. While the residents of the island looked enviously at still-pristine and Martha’s Vineyard and Nantucket where a strange but remarkable militancy kept new money out, they realized that the arrival of the first McMansion and the golf course that was built in anticipation of many more meant defeat. It is not just McMansions that are on the upswing. As this Census Bureau chart shows, the square footage for private residences has grown by over 75 percent since 1973. The number of bedrooms per house has also increased. The number of homes with four or more bedrooms has doubled since 1973. The average household size, however, has decreased in the same period. The only conclusion one can draw is that Americans don’t need bigger houses. They simply want bigger houses. Although most of us cannot afford a McMansion, we are building houses to accommodate a leaner but still impressive version of the home spas, gyms, and theaters of the very wealthy. I have no more problem with big houses, golf courses, and super-sized home media centers than I do with plastic surgery, costume jewelry, or a closet full of shoes. Developers can pave over America if they want, women can tip and tuck until their eyes won’t open. I don’t care if I am surrounded by megamalls, hundreds of Wendy’s, Pizza Huts, Burger Kings, and Olive Gardens. Bring on the big box stores, factory outlets, and theme parks. Who am I to complain? Tocqueville two hundred years ago understood America’s entrepreneurial energy. It defined us, he said; and combined with our messianic desire to create a fluid and economically mobile society, democracy in America would provide the beacon to the Old World – ossified, socially conservative, and impossibly faithful to tradition, class, and privilege. What Tocqueville could never see was how this exceptional spirit of enterprise and self-improvement would turn out. He, as a French aristocrat, would surely turn over in his grave if he could see that the country he so admired had become one big commercial strip. No more Walden Ponds, noble savages, fields of amber grain, vast empty prairies and pristine lakes. The Frenchman correctly discerned the soul of America; but there was no way he could have possibly predicted the trajectory which took us from the slave ship harbors of New England, to a muscular, take-no-prisoners Westward expansion, and to the development of the financial exchanges, commodity markets, and real estate investments which would create wealth and fuel economic demand. Early immigrants came to America not because of its culture but its promise; and they quickly got caught up in its get-rich-quick ethos. Things are no different today. America is still an energetic, dynamic and yes, a crassly bourgeois society which is as inevitable as rain. So, no one should be angered at the suburban development of Washington which now reaches over 50 miles to the west and almost to the Shenandoahs, the the east across the Bay, and to the south to Richmond. No one should be surprised or dismayed at the revivals of Levittown, the sprawl of chain stores, and the thousands of Targets and Wal-Marts. A strip mall is an icon of democracy. So is aluminum siding, cheap shoes, costume jewelry, and pre-fab houses. If America were the land of the real Versailles, we would be serfs laboring in the services of a king.